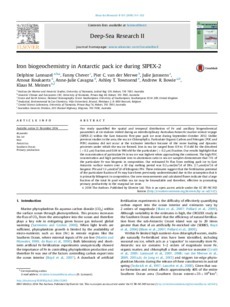 Our study quantified the spatial and temporal distribution of Fe and ancillary biogeochemical parameters at six stations visited during an interdisciplinary Australian Antarctic marine science voyage (SIPEX-2) within the East Antarctic first-year pack ice zone during September–October 2012. Unlike previous studies in the area, the sea ice Chlorophyll a, Particulate Organic Carbon and Nitrogen (POC and PON) maxima did not occur at the ice/water interface because of the snow loading and dynamic processes under which the sea ice formed. Iron in sea ice ranged from 0.9 to 17.4 nM for the dissolved (<0.2 µm) fraction and 0.04 to 990 nM for the particulate (>0.2 µm) fraction. Our results highlight that the concentration of particulate Fe in sea ice was highest when approaching the continent. The high POC concentration and high particulate iron to aluminium ratio in sea ice samples demonstrate that 71% of the particulate Fe was biogenic in composition. Our estimated Fe flux from melting pack ice to East Antarctic surface waters over a 30 day melting period was 0.2 µmol/m2/d of DFe, 2.7 µmol/m2/d of biogenic PFe and 1.3 µmol/m2/d of lithogenic PFe. These estimates suggest that the fertilization potential of the particulate fraction of Fe may have been previously underestimated due to the assumption that it is primarily lithogenic in composition. Our new measurements and calculated fluxes indicate that a large fraction of the total Fe pool within sea ice may be bioavailable and therefore, effective in promoting primary productivity in the marginal ice zone.